It didn’t start with the early “summer unpleasantness” at the University of Virginia (http://chronicle.com/blogs/innovations/whats-the-matter-with-moocs/33289). I was already enrolled and enthralled with the Massive Open Online Classroom (MOOC) movement. The UVa discussions and debate, however, led me to further investigate and challenge the movement. First, let it be known that I want MOOCs to succeed. I define success as participants learning the content at a level that shows competency to address/discuss the subject and the ability to seek a higher degree of expertise in the subject. I’ve taught online and technology courses/workshops for years. Great benefits, no panacea. In order to truly understand the medium, I have enrolled in both Udacity and Coursera courses to assess the experience. Quite frankly I am very disappointed. Coursera courses are not close-captioned, no transcripts, and no visual description of diagrams/processes. People with language issues and those who are visually impaired (who are the perfect target audience for these courses) can’t access much of the material. Pleas have gone out from these students unanswered by the Coursera admins. Coursera has instituted an empty honor code that you need to “click a box” for each quiz submission in response to recent news on widespread cheating. They fail to realize the distinct difference between discussion of “what” the answer is and “how” to solve a problem. And, an honor code without meaningful sanctions is worthless. Their draconian approach makes it impossible to work through problems collaboratively. Of course that might not be as necessary if their problem sets were correct in the first place, and clearly demonstrated upon completion of a quiz – or if a teacher/mentor was engaged in the online discussion. Again, a group of students, myself included, immediately turned to the discussion boards to question the validity of one of the quizzes. Several students encountered the same discrepancy, asked for clarification – Coursera was and still is silent. After 3 days, the students determined that we were indeed right and that the “fill in the blank” numeric answer boxes are not being properly interpreted by the grading software. And, this is not the first course where this has happened. In a nutshell, .4333 is not 0.43 Yikes! Incidentally, the #NetworkedLife Coursera student group established a Facebook Group for building community. 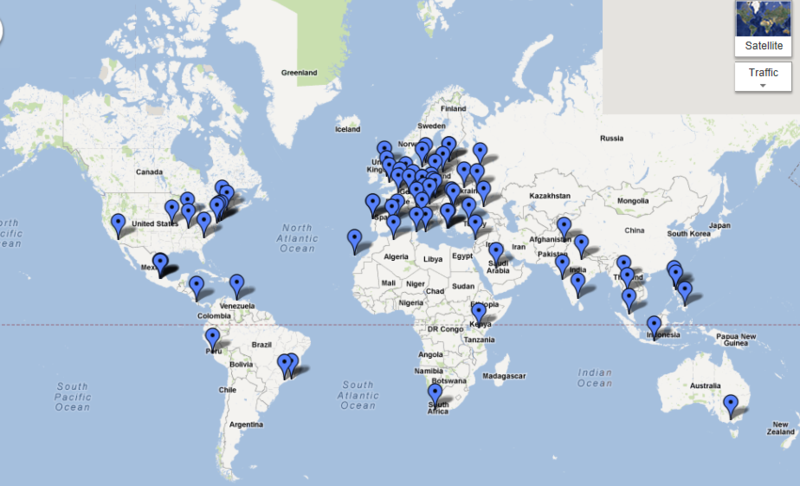 The image below provides a snapshot view of our “network” on day 3. 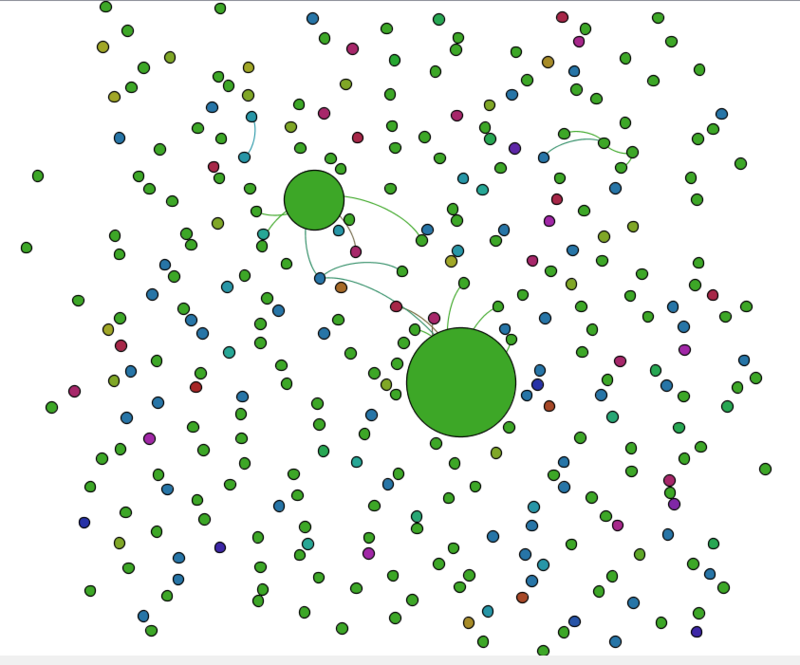 I used Gephi and Netvizz to download the Facebook group network and model it. I’ll be tracking the network over time to see if our #NetworkedLife experience leads to a true network by the end of the 6-week session. Both the Facebook network group and Google map mash-up are provided to illustrate visual models of the group. My Udacity Statistics 101 experience shows parallels. Sebastian Thron starts the course with clear examples, reinforcement, fun interaction and clear problem sets. Then, pow, the programming challenge which follows lesson 12 is presented by an assistant instructor. The problem set-up is so confusing – the discussion boards reflect this change in clarity. Udacity has been connecting and listening to students, but the jarring change from Sebastian’s clear presentation and problem set-up is disconcerting. It is very reminiscent of a large college lecture hall where once a week you break up into discussion groups moderated by the graduate assistant instead of the best university professor on campus. Maybe MOOCs have inherited some of the negatives of our traditional classroom dynamics. The problem with errors and experiences such as these is not the loss of a point on a graded multiple choice quiz. The problem is that it leads to frustration, doubt, and anger in the learner. If I solve a problem and feel confident I have mastered the knowledge only to find out that I am wrong, my confidence is shaken. If I continue without knowledge of how my solution inadequately solved a problem, I leave knowing less, not more, than when I started. Add to this the lack of immediate reinforcement and correction, the learner is left frustrated. In a learning scenario where mentor/learner can interact, this can quickly be addressed, energy refocused and confidence rebuilt. Asking for clarification in a room full of 20,000 people, with several experiencing the same confusion, and no one stepping in to redirect and acknowledge the source of confusion, leads us through a series of emotions (similar to stages in mourning): confusion, dejection, doubt, loss of motivation, and anger. Certainly we do not want our future education pedagogy mirroring the stages of grief. Especially considering the conversations around MOOCs as an answer to remedial math and science, I fear they may further divide society. Some colleges and universities are looking to MOOCs as alternatives to the increasing burden of financial aid – a way to reduce the cost of providing education to those in financial need. I fear how changing the college learning experience for an already at-risk group of students will impact these learners. Think back in your academic life to a time when you may have struggled with subject content. If you succeeded in getting over the hump, was there a teacher or mentor who helped you individually get over that hump, or even help talk you down from the ledge when you were ready to jump? Collaborative learning environments aren’t yet here – they aren’t collaborative. 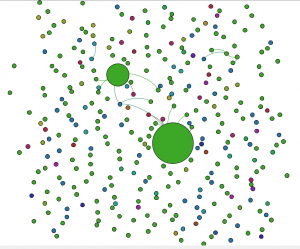 Crowdsourcing from classmates often leads to more confusion in MOOCs. Without the subject expert weighing in, we are finding our way out of a dark cave – scary. I think feedback (and outrage) from participants at this early stage is desperately needed to help shape this model into a better quality education alternative/supplement/life learning model. I want the model to work, but it really needs evaluation and evolution to be effective. I feel we need to make sure that there is awareness and distinction between blended, online, technology-enhanced learning and MOOCs. Until MOOCs are based on a solid pedagogy that supports feedback and learning, their promise is greatly eroded. Don’t even get me started on the #moocmooc experience this summer (August 12-18th) supported by Hybrid Pedagogy – http://www.moocmooc.com/. I signed up for the experience, received a confirmation and from that point – silence. I could not log in to the “canvas” and sent numerous support requests, tweets to #moocmooc, and tried to contact Hybrid Pedagogy directly. Sure there will be flukes, but the point is, I was an engaged, pro-active learner and I was prevented from participating due to lack of technology support to assist in connecting to the course (a course I was registered for). I did and still do follow #moocmooc, but I don’t feel part of the learning community. 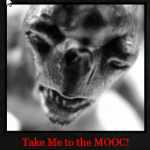 And, I’m sorry, the hideous alien on the home page neither inspires nor motivates me to learn more about MOOCs. They are not monsters, although many are doing their best to give them monstrous characteristics. What do Martha Stewart, hashish, laundry bags, and existential communists have in common? Toby Keith wrote the perfect social media anthem, “I Wanna Talk About Me.” Or at least that is the general perception and might be the reason some people literally “shy” away from social media. But as much as personal social media may be about “me,” social media by organizations puts the focus on “you” and “us.” Engaging the user is key and building a supportive, enthusiastic cadre of followers and fans is a goal. That’s the focus our course takes. Enough about the course, let’s talk about me My mother-in-law, Nana, made the best Easter pizza, an Italian tradition. Unfortunately, we don’t have the recipe and definitely want that tradition to continue. I found a recipe that seemed pretty close from Martha Stewart, so I made it last Easter and tweeted the recipe, crediting Martha, tipping my hat to Nana, and providing a photo of the masterpiece – all within the 140 characters constraints of Twitter. Almost immediately @MarthaStewart retweeted me. It was amazing to witness the interaction and engagement the Martha Stewart Twitter team orchestrated. That explains Martha, now the hashish. The hashish was a case of mistaken identity; isn’t that what they all say? I’m working with a colleague on introducing Twitter as a classroom tool for sharing insights, articles, and team-based communication. We had it all planned, but there was some confusion by the students. Using my “smart” phone, I responded, “are they using the hashtag we provided.” Oh my, much to my dismay right before I pressed send I noticed my message had been changed to “are they using the hashish we provided.” Some would say that explains the cost of higher education today. These examples illustrate some key points that we will delve into during the course: engagement builds community and a loyal following, and human intelligence (not the technology) is the key success ingredient in effective communication. I’ll save the laundry bags and existential communist stories for the course. Hope you join us! 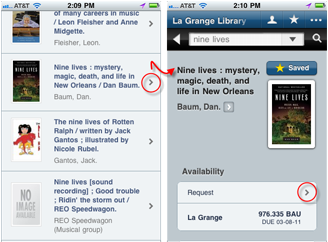 LibraryAnywhere is one of my favorite iphone apps. It allows me to search a library catalog – preferably my own, but not yet. However, it does allow me to search a library within my library’s consortium. So, hey, I can easily search the catalog and place holds on books. The closest library found when I browse for libraries nearby is less than 5 miles away from my home library. Extra bonus, I’m sitting in a coffee shop 3 blocks from that library and I have reciprocol borrowing privileges. Seems like I should be able to locate the book I want, place a hold and pick it up on the way back. Let me search for that book and see if I can pick it up. I search for the title, locate the book, and request that book. Upon making the request, I enter my library card info and voila!, like rubbing the genie’s lamp, my wish has been granted. Oops – not at all what I wanted. Looking at the message, it tells me that I will be notified when to pick up the book at Riverside. I wanted to just drop by LaGrange and pick it up. So, now, I realize I’ve inconvenienced people at two libraries who will have to process this request triggered by my love of technology and the convenience of accessing a library anywhere requesting materials. Since I work with libraries, I realize the implications of my actions and quickly try to put the genie back in the bottle. I go to “My Account” using the awkward web based access on my iphone to connect to the catalog. I remove that hold to avoid all this unnecessary work. In all fairness, this really should not be considered a fault of LibraryAnywhere, rather a shortfall of my library’s consortium catalog. But the example illustrates how an eager patron can easily take advantage of all the services offered through smart apps, without a clue to the triggers and work involved behind the scenes. 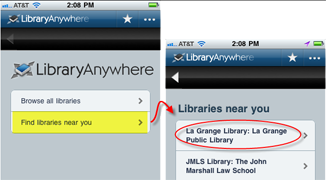 Consortiums need to coordinate registration/licensing of LibraryAnywhere throughout their membership. Otherwise the inadvertent increase of ILL requests marches on – and haven’t we all learned there is no such thing as a “free lunch” or “free delivery of a book.” Kudos to Lincoln Trail Libraries System’s LINC LibraryAnywhere which is coordinated through their consortium. Not sure how we bridge this knowledge and technology gap. I do know as a library patron, I don’t want to waste valuable time and money having library staff and system delivery resources used to pull a book from the shelves, send it 10 miles in one direction, sort it into a bag to ship back 12 miles in the reverse direction, have a staff mark the book as received setting an automated email saying I can pick the book up. Hope that email didn’t get stuck in my spam. The problem is really larger than this simple example. LibraryAnywhere is a web application too, so I can make the same exact mistake using my laptop or work computer, even without being in a hurry. I really like the fast, clean interface of LibraryAnywhere – think of the resource wastes if that becomes my default method of locating and receiving materials (in a nice stack at the circulation desk all bundled and waiting for me). There is a difference between “customer service” and “customer being overserved.” Patron initiated holds are not the problem, uneducated patrons initiating holds is – how do we effectively share good practices? Irony of all this work is that the title was sitting on a shelf at my home library and I could have gone there to check it out on my way home, rather than waste all these resources. Technology is great – but, too often it helps us make bad decisions faster. About a year ago I purchased my first Kindle and was immediately impressed. I thought I’d found a new technology partner to take with me everywhere. The task of reading and holding the Kindle is quite enjoyable – easy on the eyes, easy to page forward through a book and lightweight. But, I quickly discoverd I have some very definite preferences in reading material selection and how I use my books. Ok – now the confessions. First, the reading material – I read lots of reference books, science and philosophy. Also, I’ve been doing research on social network analysis and the impact of social media in organizational development. Secondly, I have to admit that I am a note taker (in pencil, in the margins) - thinker – go back and review page turner - compare that with a previous passage flipper - turn down a corner kind of reader. 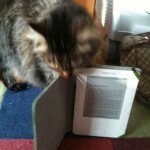 I have a much more tactile engagement with books than I ever realized or analyzed before my Kindle adventure. Although I’ve taken lots of self evaluations on learning style and know that I am a kinesthetic, visual learner, I never really thought about how that translates into “kindling.” I did take copious notes on the Kindle when reading reference books. It took so long that it really disrupted my thinking process. On several occassions I had to do an Internet search to find a table or graphic that just wasn’t up to snuff on the Kindle. I do think I gave this a good workout in the past year. I read 6 books and subscribed to two newspapers via the Kindle. I purchased three eBooks for roughly $1/each. Although I wanted to try out the blog feeds, I had a real aversion to paying $1.99/monthly for those. Note to Amazon – if you really want this technology to become pervasive, you need to make as much content free as possible, especially content you can access free via other technologies. No one has to pay for free blog feeds on an iPad. make it a bit dirty.” I take it back, this article is worth $1 in entertainment alone. As for the newspapers, they get a mixed review. First, monthly charges can really creep up on you. If I could not make it a daily habit, it had to be cut. My husband was thrilled when the Chicago Sun-Times became available on the Kindle. The plan was he would take the Kindle to work reading the paper on the train and I would get it at night. He suddenly realized that his two favorite parts of the paper were the comics and the sports box scores – neither of which were provided. If you can’t get the whole paper and have to buy the print version for those missing pieces, it doesn’t make much economic sense to get the Kindle edition. So, based on my experience, I totally understand why “E-Book Readers Bomb on College Campuses.” I agree that one day students may be reading all their schoolbooks on some type of handheld device. But, those students will need to be introduced early so that they can build new habits of highlighting, folding and leafing through their books. IT director, project manager, grant writer, teacher, mentor, tech support … mom. I take my job(s) seriously, especially the last one listed – mom. That is why I find the Clear.com commercials so offensive that I can’t ever imagine using their service or supporting their company. I have such a visceral disdain for the message those commercials portray of the busy working mom. I tweeted about this a couple of months ago, but today I saw that not only have these commercials persisted, they’ve added another vignette of the self-absorbed working mom. Jeff – working dad racing to get to a meeting on a business trip away from home. His “lame” boss lost the presentation so Jeff connects to his work computer, downloads the file and is ready for the meeting. And, in the cab ride he has time to video chat with his young son. Isn’t Jeff a great guy and a great dad! 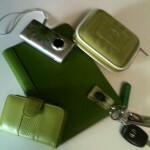 Wendy – sitting at home with her netbook, she’s booking a girl’s weekend away. She gets a reminder to pick up her daughter after band practice. She is clearly annoyed. She parks in front of the school and is checking out party dresses for the trip. Her excited daughter runs to greet her with tuba in tow. Mom rolls eyes – the online ordering got disrupted. So, what message is this sending to working women? I’m certainly not amused. Now, fast forward a few months of seeing these offensive commercials and today an update. Wendy is searching for spas to attend with the girls. She states how happy she is not to be going to a water park. Well, Wendy you are a loser and so is Clear.com in my book. Any ad campaign that would run such offensive gender-based personality profiles hasn’t a clue about marketing. 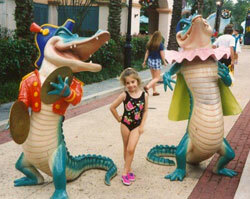 Oh, how I’d love to be at a water park with my almost-21 year old daughter right now! Today I followed a tweet from the University of Virginia that showed what geographic area the Gulf oil disaster would affect if it was centered at UVa’s Rotunda. Using the same site, here’s what it would affect on Day 51 if it was centered in my own back yard. Think of every animal, plant and human in that geographic area being adversely affected. It is frightening and infuriating. The situation illustrates how systems and people fail – not deliberately but regularly. What does that mean in our own daily lives and work responsibilities? We can’t wait till things break to fix problems. My college roommate was an artist and graphic designer, long before computers did that sort of thing. She moved to Colorado and we lost touch, because we didn’t have facebook, linkedin, twitter or classmates.com back then. This past summer we reconnected as I was determined to track her down and was successful. She is the owner of two design firms and after we reconnected, we collaborated. And, I must say it was great to work with her staff, catch up with years of work and family stories, and forge a new partnership. 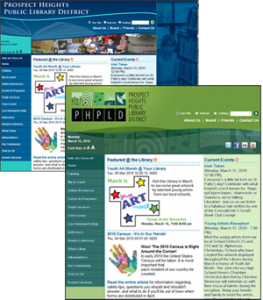 Watermark International partnered with BellCow, Inc. on a recent website reskin project for Prospect Heights Public Library. We were able to work together to minimize recoding of pages since the pages were based on site templates using include files and css. Terry’s other firm, InTandem, specializes in target marketing through effective use of social media. So if you are looking for a website face lift or a message make-over, we can provide the team to make it happen. This has been a rough week for Illinois libraries. The North Suburban Library System, as all Illinois library systems, is in crisis – they have not received much of their funding for their fiscal year which ends in one month. We hear these stories in the news each night in our state, highlights of educational and social service organizations who face huge layoffs and reduction of services because our state is not able to fulfill its fiscal obligations. No matter how many advocates our library community has, or how many politicians we urge to take action, or how many creative strategies we envision for reinventing our organizations and reduring reliance on state funding – we are stuck in the middle of a broken system. It takes strong leaders to admit this reality and make hard decisioins that affect staff and members they serve. Those who refuse to compromise quality are commended. The lessons: work hard, form partnerships, share expertise, and move on. Best wishes to all my colleagues who will be contributing in new ventures soon – be proud of your legacy and start building the next. Sometimes it takes getting your hands dirty to make a difference. 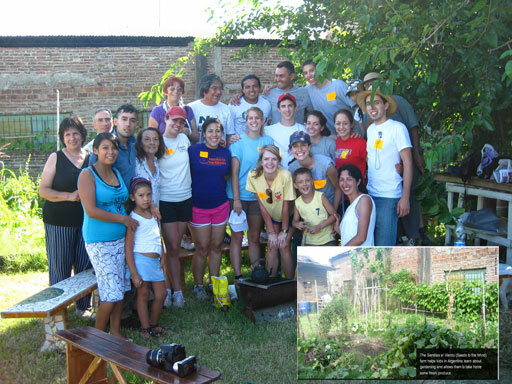 A group of University of Virginia students learned that “first hand” in January when they spent their winter break working outside of Buenos Aries, Argentina. Their initial assignments seemed impossible for their two-week stay – build an adobe hut/bathroom, tame an overgrown space and prepare it for gardening, paint some buildings, and plant seedlings. But they accomplished their goals and within three months the fruit of their labor is growing abundantly. 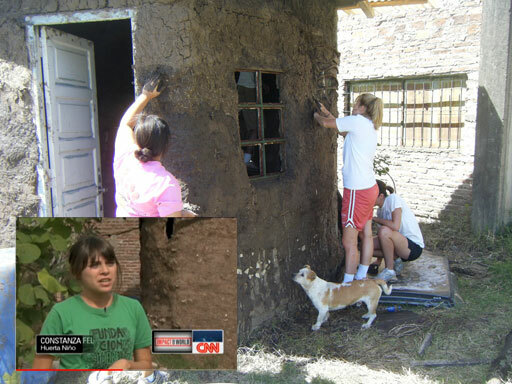 CNN’s feature “Kids in Argentina learn to grow their own food” shows the garden, the organization leaders they worked with, and most importantly the impact on the children. to clear additional farming land and build adobe huts and bathrooms. They also left a sizeable donation. They have continued to stay connected via social networking, sharing pictures through flickr, communicating via facebook, email and gchat. When electricity and an Internet connection could be found, they provided an occassional blog entry during the trip. Ruben teaches us how to make adobe, which is made from dried grass and dirt. After gathering these things you mix them together with water using your hands. You then move on to mixing with your feet, a la “I Love Lucy”. cut up soda bottles to protect the trees from the lawn mower. All in all it was very interesting to see gardening in another country. The hands-on learning extends into technical areas too. The site leader for the trip volunteers as Alternative Spring Break (ASB) webmaster. You can easily make a donation online. BellCow, Inc. helped the Argentina group by funding their daily transportation to the work site from their Buenos Aires hostel (which was without electricity for almost a week and lacked running water for a few days). The original photos taken in January with inserts from the CNN report in April, show how far the community garden has developed in a short time. Good intentions, hard work, committed leaders and a little horse manure go a long way. 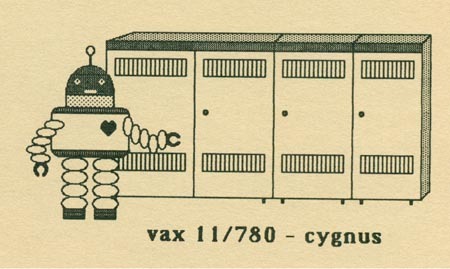 Spring cleaning has uncovered some newsletter archives from 1984. Pyrotechnics, a brilliant or sensational display, as of rhetoric (The Random House Dictionary), was published for 9 academic years (1983-1991) by Academic Computer Services at DePaul University. The articles are quite entertaining in today’s state of technology. “ACS is selling terminals, which for a variety of reasons we no longer need. Can’t help but appreciate those computer graphics, created on the original Macintosh.